This topic contains 30 replies, has 5 voices, and was last updated by Alan Brinton 8 months, 2 weeks ago. 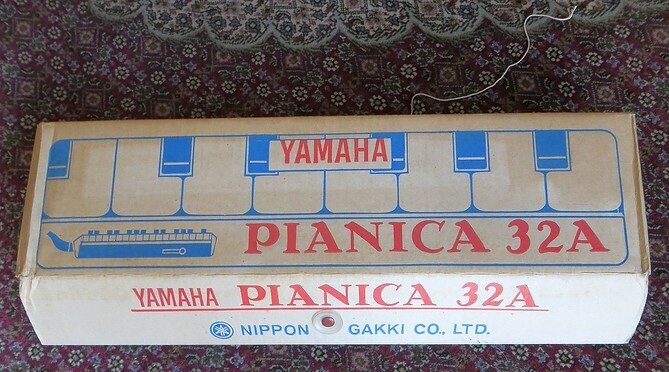 I have recently had the extraordinarily good fortune to acquire a brand new Yamaha Pianica 32A. The 32A is the early to mid 1960s successor to the orginal Yamaha/Tokai Gakki Pianica, the Pianica 32. This one came in absolutely mint condition in the original box, unused and apparently stored under ideal conditions. It looks and plays like a new instrument, which is to say comparably to a new Yamaha P-32D. I have an “older” Pianica 32A, so I will be able to make comparisons. 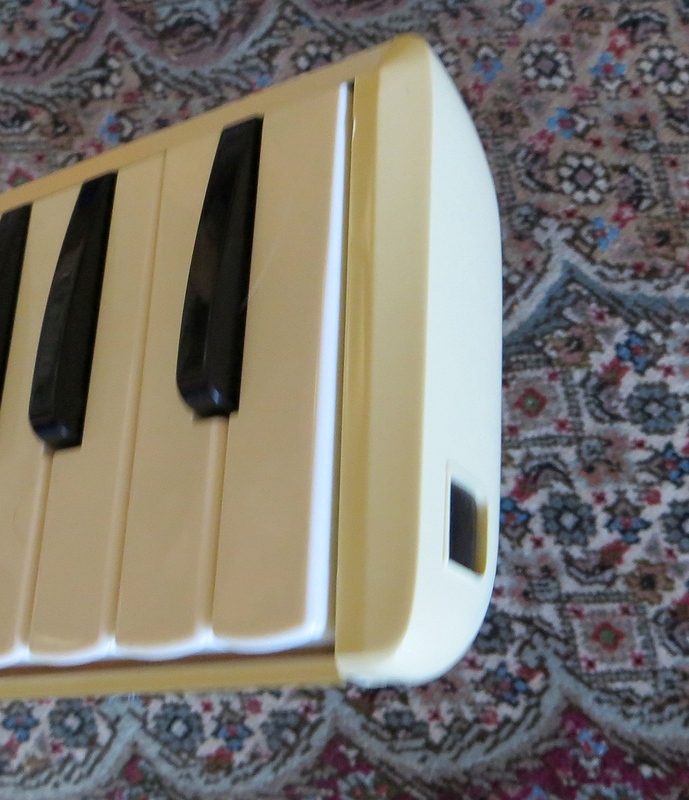 But this one has no problems with sticking keys, air seepage, or any other annoyances of 1960s melodicas. 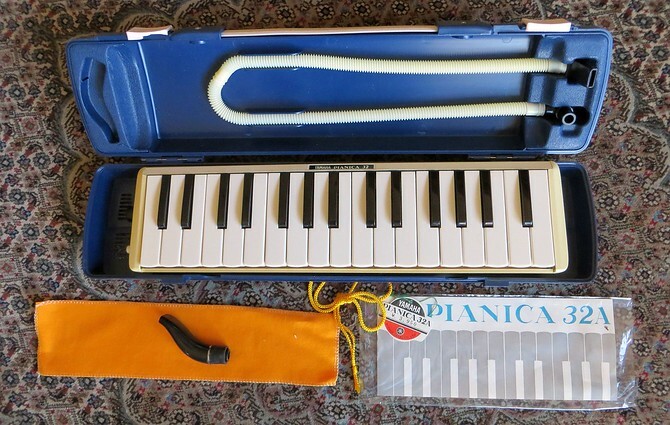 The Pianica 32A typically does not come in a plastic case. This one does, so that it probably comes from a late production run, which means around 1970. Great find! Any advantages/disadvantages compared to a new P-32 D? A few differences, Shannon, that could be regarded as advantages or disadvantages one way or the other: (1) Although the sound is quite similar, it is a bit softer on the Pianica 32A. (2) The Pianica 32A has a “rod” spit valve mechanism, as compared with the common button mechanism of the P-32D. The rod button is pushed from the mouthpiece end. This is a far superior kind of mechanism that allows air to be vented much more freely, but some won’t like the push button location. (3) The P-32D is typical of current 32 key melodicas, starting at F, while the Pianica 32A starts two keys higher at the G. (4) The distance each key depresses is shallower on the Pianica 32A than on the P-32D, so that it’s easier to play glissando on the Pianica 32A. 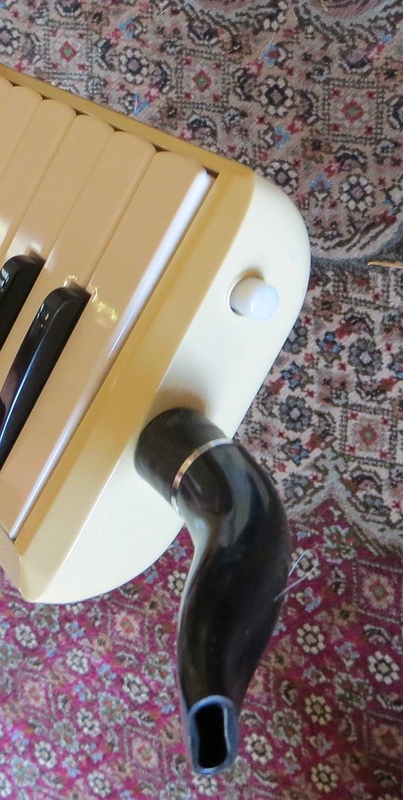 (5) Some may be influenced as I am by the distinctiveness and aesthetic satisfactions of a recognizably vintage instrument, in this case including the metal tray and conservative two-tone color scheme. 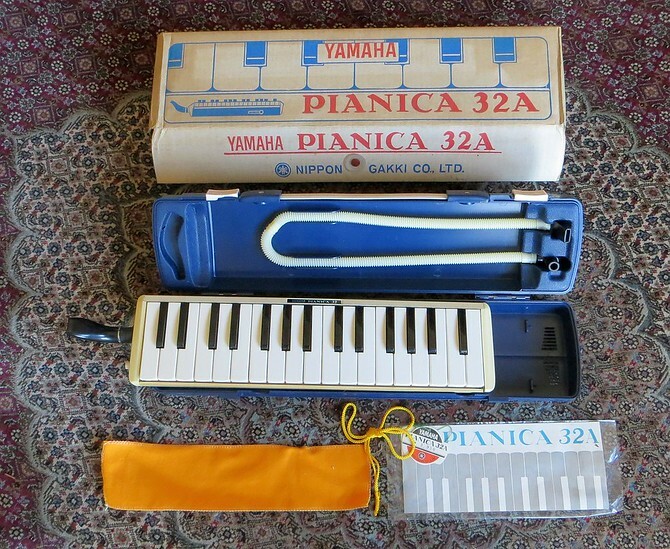 I love my P-32D and wouldn’t give it up for the Pianica 32A, but the 32A in good playing condition is a desirable vintage melodica. Thanks, Alan. There are so few opportunities to try new melodicas (I have absolutely no access to them) that the vintage instruments at reduced prices are very tempting. However, it is something of a pig in a poke. I have been generally satisfied with my vintage purchases, but the only new melodica I own is a Hohner Performer 37, which is definitely not of the same quality as my vintage Hohners. And some of my vintage instruments needed/need some work (e.g. clavietta, Hohner professional 36) Good to hear that at least Yamaha (and also apparently Suzuki) is still making quality instruments. Can’t go wrong with a Yamaha P-32D or P-37D or a Suzuki M-32C or M-37C, Shannon. No risk with any of those, and they’re a huge step up from the Hohner Performer 37. Where are you Shannon, if you don’t mind saying? I live in central North Carolina. About an hour from any major city. Right now I have a house full of melodicas (very susceptible to MAS). Over a dozen at last count-vintage Hohners, Suzuki’s, and a Clavietta. My current fav is a Melodion 36, although I recently acquired a Melodion MA-32 Super II, which is quite nice as well. Having loads of fun with all of them. My most recent was a Suzuki b-24. Certainly more challenging to play, but I really like the sound. Breath control certainly harder, but that is my problem, not the instruments. Sorry to get so off-topic. 8^P This is all great fun! The MA-32 has a unique sound. I think there are few places where one can actually go and see or try out melodicas. Beautiful state, North Carolina. Hi guys, this is off topic, but, Shannon, you are in North Carolina?! Did you know we have a melodica band right here in Asheville (people in it are from Hendersonville, Black mountain etc)? There are 5 of us and between us we own at least 40 melodicas (is this a sign of MAS?). So if you want to try out modern Yamahas, Hammonds and Suzukis, we’ve got piles of them. And you are welcome any time to sit in – we play every kind of music we can. That pianica A32 has got the range that I covet most. Do you have a Pianica 32A, Barbara? Alan, No I don’t. I love Suzukis, however, and now will keep my eye out for one. !! I have another one coming. Maybe we can work something out. Wow, Alan, that would be great! I’ll get back to you on this in a couple of weeks. On my profile, you’ll find my email address. If you contact me, we can talk about a P-32A.